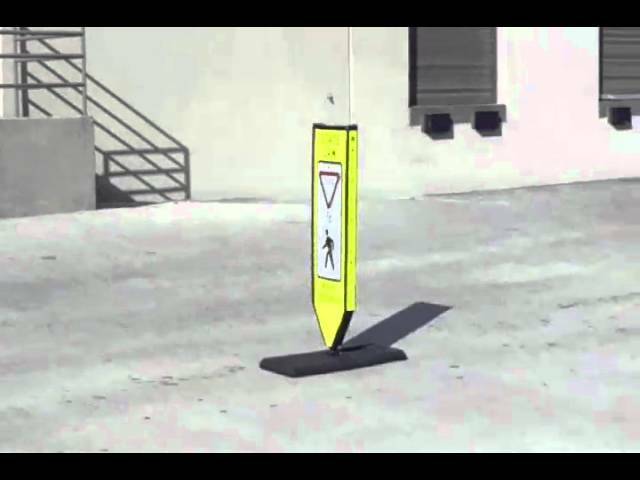 Omni-Ped provides enhanced conspicuity for both signalized and unsignalized intersections, in order to alert motorists to local laws concerning yielding to or stopping for pedestrians in crosswalks. Omni-Ped’s blow-molded, 4-sided design provides added benefit to pedestrians by providing fully customizable side panels that inform pedestrians of local ordinances or traffic conditions specific to their area. Omni-Ped pedestrian signs also increases crosswalk safety by alerting distracted pedestrians to the presence of vehicular traffic that could otherwise go unnoticed. Omni-Ped’s durable one piece design and patented, anti-twist reactive spring system ensures the unit will stay in place impact after impact to reduce replacement costs. Impact Recovery Systems wins the first place 2010 ATSSA Innovation Award.